Former Philadelphia star guard Allen Iverson was amenable to a trade to the Timberwolves in 2006, in order to team up with Kevin Garnett. Revisionist history is a dangerously fun kind of history. It allows us to re-imagine outcomes and scenarios with the benefit of hindsight, exchanging a less-favorable actual past for a more desirable imaginary version. In the process, we forget about potential obstacles or reasons something might not have been so great. Hey, if we’re reinventing a fictional past, we get to decide the terms, right? So let’s dig into a fun item from Adrian Wojnarowksi’s recent podcast with The Vertical in which he talks to former 76ers GM Billy King. 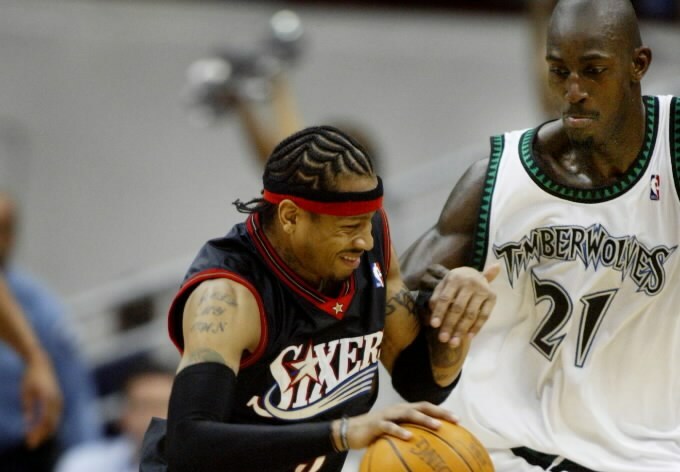 In the podcast, King reveals that former Philadelphia star guard Allen Iverson was amenable to a trade to the Timberwolves in 2006, in order to team up with Kevin Garnett. The trade never happened, of course — Iverson was soon after traded to Denver — but let’s imagine that it did. And let’s play the revisionist history out to its fullest extent — but for better AND for worse. An Iverson trade to the Wolves in 2006 — depending on what the Wolves had to give up, of course — would have made a borderline good team even better. It would have given Garnett a legitimate running mate and his most dynamic teammate since Stephon Marbury forced his way out. Bleacher Report has a GREAT image that it tweeted out. The combination of both players’ wills and skills very well could have made the Timberwolves a playoff team in 2006-07. Remember, the Wolves even without the trade were 20-16 at one point that year. The West was stacked with good teams (Dallas, San Antonio and the Lakers, just to name a few), so it’s hard to imagine the Wolves would have made a deep run. But a playoff berth and maybe a first-round series win with those two? Sure. If the Wolves had made the playoffs that year, they almost certainly would not have fired head coach Dwane Casey midway through the season (a move that looks awfully bad in hindsight, regardless). And it’s a 99.9 percent certainty they wouldn’t have traded Garnett in the 2007 offseason coming off a playoff season and with Iverson still going strong. That means Boston almost certainly would not have won the NBA title in KG’s first year with the Celtics. Maybe the KG-Iverson combo would have been good enough to keep the Wolves afloat for much of the rest of the decade, assuming they both stayed healthy. Iverson would have been 31 at the time of the trade, while KG would have been 30 — so both were going to be entering a period of decline, but both had plenty of productive seasons left. If that happened, maybe KG never would have been traded at all. However, if Garnett was never traded and the Wolves remained a playoff team or fringe playoff team all those years … they probably never would have bottomed out (and Garnett probably never would have won a championship). True, they wouldn’t have endured all the lean years — some of which were truly hideous. They quite possibly never would have employed Kurt Rambis or David Kahn. But they also quite possibly would not be in the position they are in right now — with a nucleus led by No. 1 overall picks Karl-Anthony Towns and Andrew Wiggins that has the potential to do serious damage in years to come. So I guess in this history revision, you have a choice: 5-8 years of pretty good basketball and the sight of KG and AI as teammates, though probably not on a title-contending team, leading to a period of decline in recent years … or 10 years of constant rebuilding, leading the point the Wolves are at right now?